We were chosen as the preferred supplier to help move the client from an ageing, poorly performing website content management system (CMS). Click here to visit the new web site. Their website had sprawled in terms of content, so an initial task was performing an audit on the website content. This helped create a leaner online, information structure which better reflected the needs of their diverse audience. The website is fully English/Welsh bi-lingual. An issue with the previous website was a reliance on PDF attachments & spreadsheets; not only are these cumbersome types of content from the online user’s perspective; they were not always the best way to present complex information to the general public as not everyone is a master of Excel. To this end we helped provide responsive graphic systems to help give the client ways of presenting such information in graphs and infographics. Best of all, these techniques were viewable by all manner of devices: from desktop computers to smartphones. “We needed a new website which encouraged two-way conversation with a broad-based public audience – and that’s just what Glass Mountains delivered. They did it on time, on budget, with strong listening skills, no fuss, lots of technical expertise and quickfire responses and actions. They simplified the fast-evolving field of digital communication for us, offering a refreshingly low-jargon approach to a complex subject. 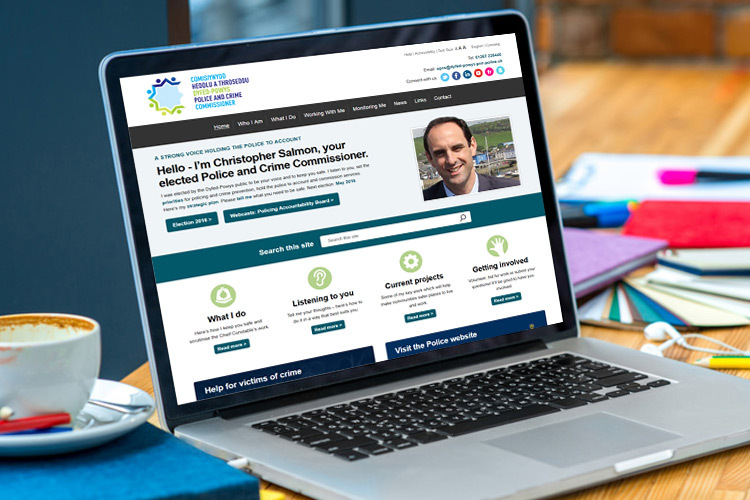 We have additionally created the Help Hub; which is a separate, database driven website helping to pair victims of crime with organisations who can help.